You can rename a workspace through the Workspace Manager dialog box. In the Workspace toolbar, click the button. From the top menu, select Windows > Workspace > Workspace Manager. Choose the workspace to be renamed from the list. 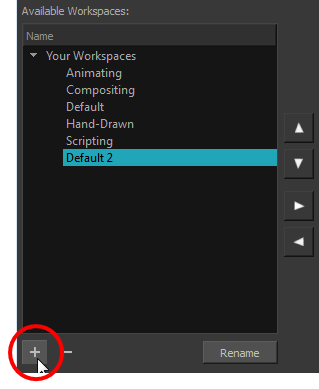 Double-click on the workspace to be renamed or click the Rename button. This allows you to edit the name. Type in the new name of the workspace. Press the Enter/Return key to validate the name.